A: The Chamber of Commerce is an organization of businesses within a community dedicated to maintaining a favorable business climate and safeguarding the interests of its members. Q: What does the Chamber of Commerce do? A: Chamber membership is more than just a certificate on the wall. Each day, the Chamber is constantly hard at work representing the interest of the Greater Idaho Falls business community at the local, regional, state and national level. Q: What are the objectives of the Chamber of Commerce? 1. To advance the economic well-being of the entire region. 2. To assist in general planning and development of the community for the benefit of all. 3. To coordinate programs that give the community the greatest opportunity for orderly growth and prosperity. 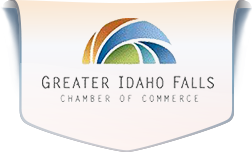 Q: How is the Greater Idaho Fall Chamber of Commerce Supported? A: The Greater Idaho Falls Chamber of Commerce is supported by membership investments, program user fees and revenue fundraising events. Q. What are the best marketing and sponsorship opportunities for my business? A: Every business is different, and the Chamber has a wide variety of sponsorship and marketing opportunities available to meet your business’ or organization’s needs and help promote your business. Please contact the Member Services Coordinator by emailing membership@idahofallschamber.com to learn more. Q: What recurring monthly events or programs does the Chamber conduct that I can put on my calendar? 3rd Thursday of the month: Business After Hours, 5:00 p.m., location varies (check event calendar for monthly details). Q: Are RSVP’s/Registrations required for programs and events with the Chamber of Commerce? A: Some programs require registration, while others don’t. All events and programs that cost to attend do require a pre-registration. To determine if an event requires registration, click on the event title or date in the Event Calendar. Q: How do I sign up to be a Featured Business at an Out of the Box Networking Lunch? How much does it cost? A: To sign up, e-mail programs@idahofallschamber.com. A contract will then be sent to you requiring a signature in order to confirm your spot. The cost of being a Featured Business is $65. Q: Can I participate in Chamber events and programs if I am not a Chamber Member yet? A: Yes. There are nominal fee differences for members versus potential members for most programs and events, but all are invited to come and participate. Q: My company wants to host a Business After Hours within the next year. How do I sign up for that, and how much does it cost? A: Contact programs@idahofallschamber.com. You will be sent a contract requiring a signature. Once the contract is received, you will receive an e-mail verification confirming your host date of choice. The cost of hosting a Business After Hours is $500 September-May, and $250 June-August. Q: What sponsorships are available for special events? A: Click on “Event Sponsorship Opportunities” under the Events tab. Here you will find details of all event sponsorships. Companies may sponsor more than one event. Event Sponsorships are accepted on a first come, first served basis and are considered committed when payment has been received. If interested, contact programs@idahofallschamber.com. Q: Can I pay for my membership dues online? A: Yes, go to www.chambermaster.com and click Member Login in top right corner. Enter your user name and password. Click Pay Bills Online, which is found under Member Info on left side, and then follow listed instructions. Q: Who should I call/contact if I have a billing question? A: Sue Christensen, officemgr@idahofallschamber.com or 208.523.1010, Option 4. Q: Where should I mail my payment?